When it comes to real time reporting for the call center there are two categories of report types and they are: Status Reporting and Performance Reporting. At a glance these two types of reports look very similar, however, when examining them further there are subtle differences. Knowing what these differences are and selecting the correct reports for your call center will make your reporting successful. The call center manager needs to know what type of reporting to choose for the call center or be seen as wasting time and money on reporting that has not done anything for the business. To be able to choose the manager must take a hard look at their call center, agents and team leaders. Is the call center performing well and meeting its goals? Or do you want to step in frequently to remind everyone why they are there and the job they are suppose to be doing? Status Reporting is for the call center that is mature, has agents that perform at a high level and need very little training and coaching. This call center knows what they are doing, knows their SLA's, the agents know their goals and regularly achieves them. This call center will have turnover that is lower than the industry averages and have agents that adhere to their schedules. There are other KPI's that call centers will include which will depend on the call center, the industry, the agent performance and other factors. 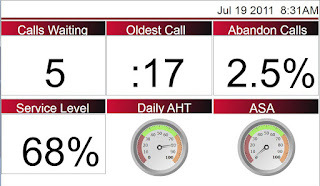 But the KPI's shown above are the critical metrics a call center that is performing at a high level should see. These metrics help the high performing agents do an even better job. 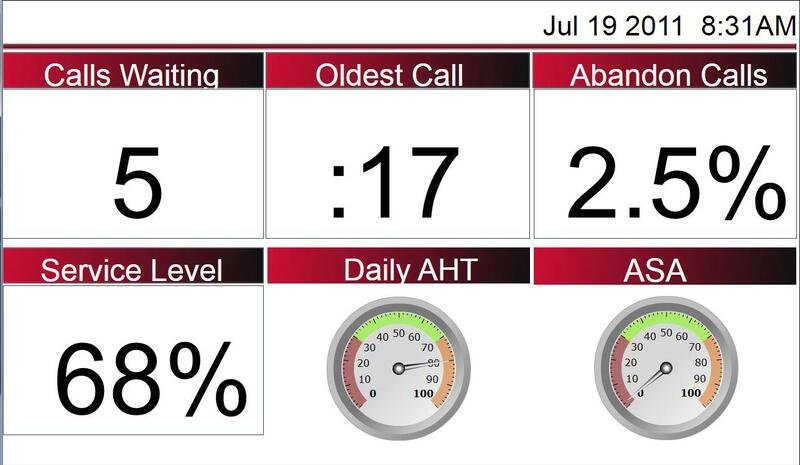 This call center knows what needs to be done when the AHT is slipping or when there is a drop in the service level. They want to know when there is a call in the queue or how long that call has been waiting. These agents are well trained and will react properly to these statistics. Performance reporting is for the call center that needs encouragement to reach their goals, has turnover that is higher than industry averages, does a lot of training and coaching and still misses the mark. This call center, large or small, seems to be on a roller coaster - some days the agents do very well other days not so well. This type of call center needs performance statistics that show how they are performing and what needs to be done. These metrics help the agents with awareness which is typically lacking in an underperforming call center. For example, calls in queue and agents available are listed because too often the underperforming call center sees calls in queue and just assumes no one is available to take the calls. To help the underperforming call center improve agent performance reporting is the best alternative. By becoming more granular the reports can be more detailed and specific to each level of the call center. Status and performance information for the call center is good but by adding more detail and providing that to the agent or supervisor we can further drive improvement in the call center. For the manager who has nine very good agents and one underperforming agent a different approach is needed. The single agent needs performance information while the rest need status information. Agent status and performance information is delivered to the agents desktop showing the statistics for the agent and not the group. This type of information drives the agent to maintain or improve their performance. A highly effective agent needs only status information while the underperforming agent needs their individual performance information at their desktop. 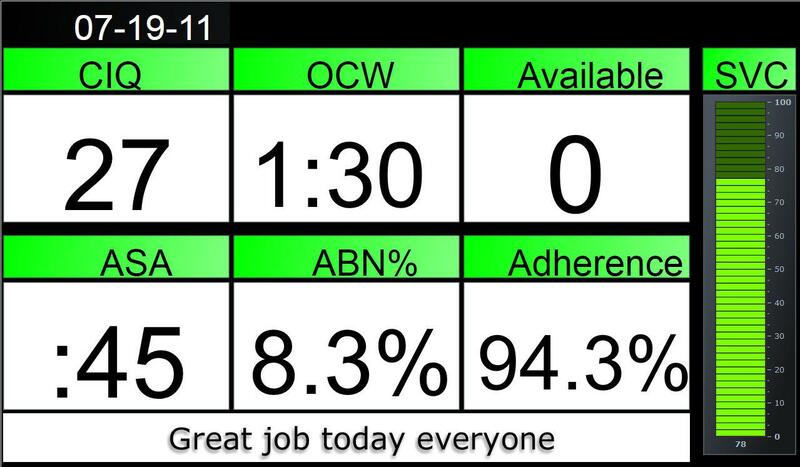 Couple that with group status information on a wallboard and you have an effective tool to help your agents improve their performance. Team Leader status and performance reports will show group information. The team leader (supervisor) is able to see where coaching and training are needed and direct their efforts accordingly. A leader managing a sophisticated performing group will want to see status information to the desktop or dashboard. This content will be for the group with some drill down capabilities for specific agent information. While the supervisor of an underperforming group will need to see performance information so coaching and training can be applied. Call center status and performance reports should show the details for the enter call center with drill down to the groups and specific agents if necessary. In a successful call center overall status information with drill down to the group and agent level will provide the manager with a level of satisfaction and comfort. This manager knows that all of the agents are performing but when something is out of alignment the manager can still drill down to see the cause of the variance. In a call center that is struggling the manager will want to see overall performance information. This type of information will assist the manager in directing coaching and training efforts. Sometimes it is not the group that is underperforming but rather an agent. Drill down to agent information offers the manager the tools to find the source of the problem and make corrections. For those that are reading this article and disagree with Average Handle Time as a meaningful metric, I agree, to a certain extent. An underperforming agent, group or call center should not focus on AHT. However, a successful agent, group or call center sees the AHT and knows how to improve that number. For call center reporting to be successful and help the content must be appropriate. Providing the wrong information can be wrong or de-motivating. To select the right type of reporting the manager must take a hard look at the call center and determine if they are a successful or an underperforming call center. Once the manager realizes what type of call center they have steps can be taken to offer the right information to the agents, team leaders and manager. Spectrum is a leading provider of Unified Contact Center Reporting. Contact Spectrum today to learn more about status and performance reporting solutions.